University of Missouri, 9780826217028, 536pp. After 1921, the clouds of suspicion and resentment left by the Great War gradually obscured the strenuous efforts of negotiating statesmen and led to ever greater appetites for power at sea. By the midthirties, worried admiralties around the world were bracing themselves for a new and deadlier round of global violence. In this monumental study, Lisle A. Rose revisits the strategies, battles, ships, planes, weapons, and people of the most destructive war in history to show the decisive influence of sea power upon its outcome. During the years preceding World War II, Britain’s once dominant Royal Navy, beset by national economic decline and steadily eroding morale within the fleet, pleaded for the appeasement of dictators in Europe and the Far East in an attempt to avoid a three-front maritime war that would surely doom the British Empire. Desperately hoping for time to build a formidable fleet, Hitler’s admirals feverishly tried to rebuild German naval weaponry upon a technological foundation not much improved since 1918. In the end, it was Japan and the United States, facing each other across the broad Pacific, that moved naval history into a new phase by fashioning ultramodern navies based on the integration of sea, air, and amphibious forces. Rose relates how the strengths and weaknesses of seafaring nations came into play within the crucible of a six-year war during which naval encounters were every bit as critical and frequent as land-based fighting. He recounts the well-known naval battles and operations of World War II from a novel perspective, placing them in the context of daring gambles open to both the Axis and the Allies that were either seized upon or ignored. Once Britain’s survival was assured, and the Allies held on in the North Atlantic and the Pacific, however, the superior industrial culture of the United States doomed the Axis. After 1943, America threw into the deadly battles against the German U-boats and the Japanese fleet more and better ships, more and better citizen sailors, better intelligence, and better strategies than did its antagonists or allies. Two years later, the United States had not only defeated the Axis, it had also won control of the world’s oceans from its exhausted British ally. In the process, it had begun a revolutionary transition in which power at sea became power from the sea. 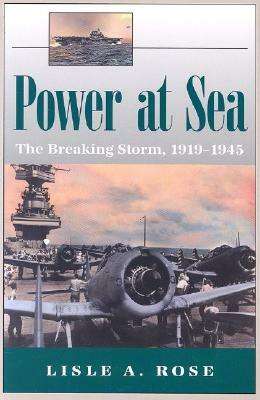 Whether recounting the heart-stopping action of naval encounters or analyzing the technologies that made victory possible, Rose traces in vigorous, memorable prose the dramatic emergence of a new naval power that would leave all others in its wake.